H. J. Hoff was Herman Joseph Hoff (1848-1914). Hoff was an immigrant from Germany, and his foundry was located at 556-560 Hamilton Ave., Brooklyn, from 1896 to 1911. The foundry, also known as the Prospect Iron Works, was founded around 1886 when it was located at 251 Prospect Ave., Brooklyn. The Prospect Iron Works stayed in business until 1957. After 556-560 Hamilton Ave. they were located first at 486 Hamilton Ave. (1912-1935) and then 80 19th St. (1936-1957). The following obituary appeared in the Brooklyn Daily Eagle, 29 March 1914, "Herman Joseph Hoff, owner of the Prospect Iron Works, long a leading citizen of South Brooklyn, and a member of the South Brooklyn Board of Trade and the Brooklyn Saengerbund, died yesterday after a long illness from diabetes at his home, 720 Fourth avenue, where funeral services will be held Monday at 8 o'clock. Mr. Hoff was born in Germany, May 22, 1848, and had lived here thirty-seven years. He was married to Annie C., daughter of the late Adam Sem. She survives him as do two daughters, Bella and Lillian; a son, Herman, and a brother, Stephen." Hoff appears in the U. S. Census reports for 1900 and 1910. The 1900 census gave his birthdate as May 1848, and year of immigration was 1878. In 1910 he was "retired." Herman J. Hoff had a son, Herman J. Hoff, Jr., but Herman Hoff Jr. does not seem to have been involved in the foundry. Census reports indicate he was in the insurance business. 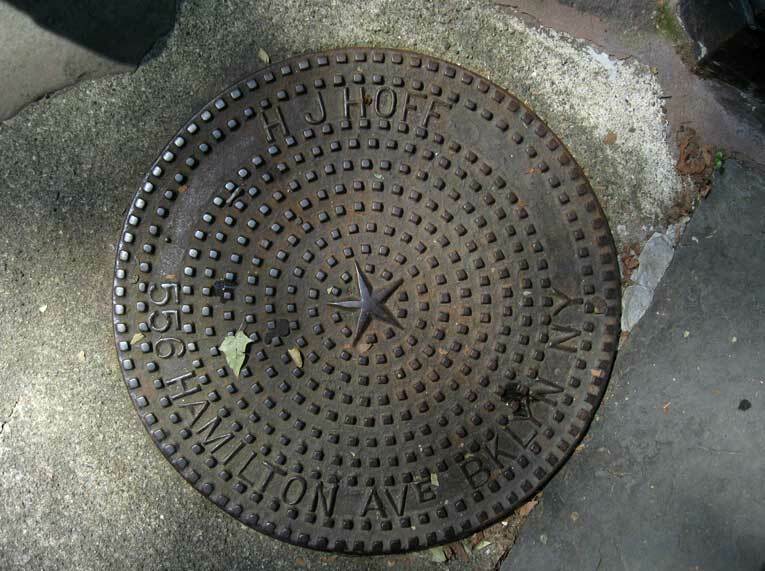 Nick Sherman has a nice photo of a H J Hoff coal chute cover on his flickr site.